Rather than make a number of separate weekend trips to visit friends and family this summer we decided to fit it all into a single ten-day trip, seeing Margaret’s daughter and my brother on successive weekends (as they are working) and seeing a number of retired friends during the week. 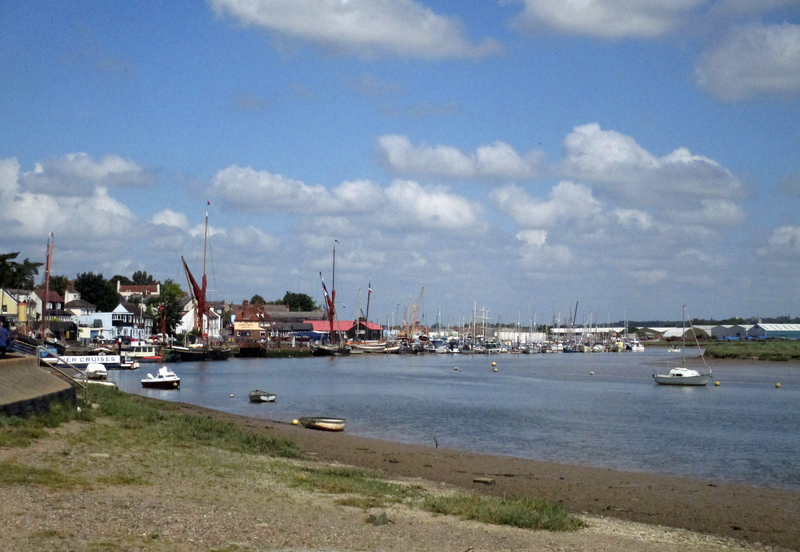 We arrived at Maldon in Essex in the afternoon of the 26th. The following day we all cycled along the River Blackwater and the Chelmer and Blackwater Canal for a picnic. Here Margaret’s son-in-law John surveys the canal. Anita, Margaret’s daughter, also had her old school friend Donna (also from South Africa and now living in London) staying with her. 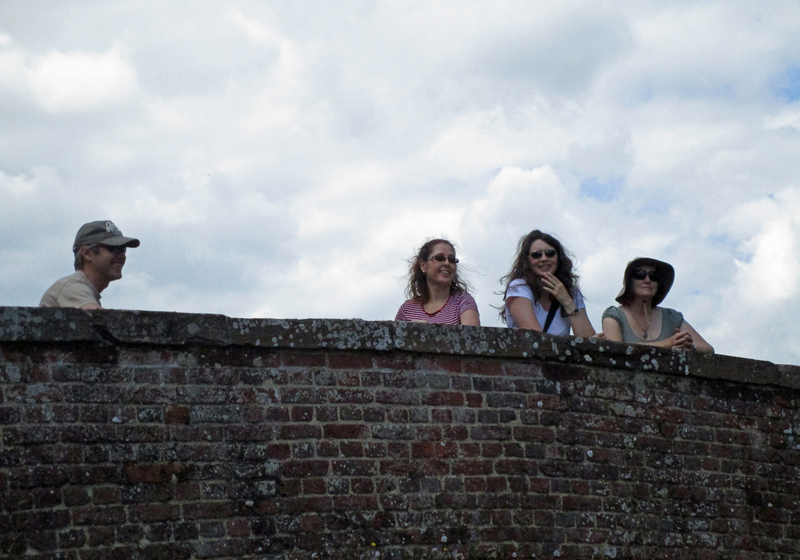 L-R on the bridge over the canal: John, Donna, Anita and Margaret. On the Sunday morning I did a little birding at Heybridge Basin where the River Blackwater and the canal flow into the sea. 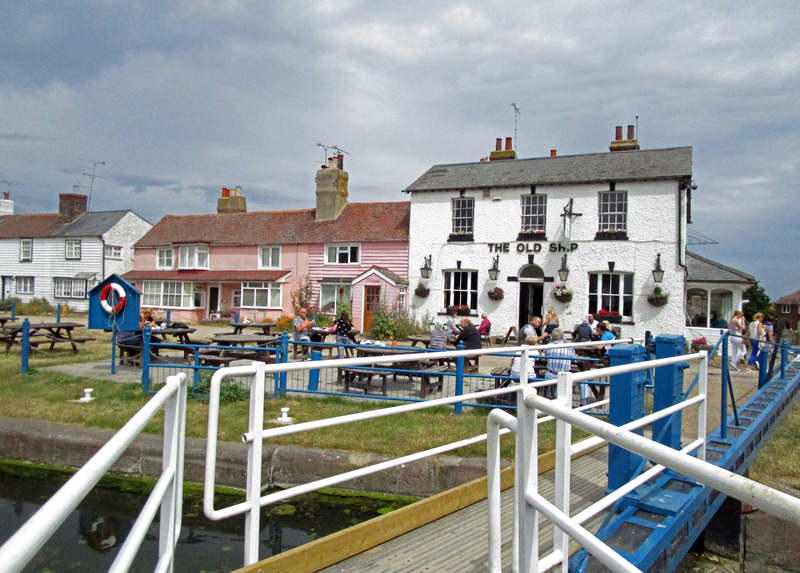 The footpath, popular with locals, takes you over the canal locks and along the river bank. It was a pleasant walk but the grey clouds seen above soon closed in and it started to rain. In the winter this estuary is teeming with waders such Avocets, Curlews and Black-tailed Godwits but in late June there was little but the local breeding Oystercatchers and Common Terns. Late on Sunday we left Essex and drove to Cottenham near Cambridge to stay with my old friend Jennie. I met Jennie in 1972 during my last year at University whilst she was doing her PhD. From 1973 – 1976 we shared a house with three others until I got married to Janet in the September of that year. Jennie is a keen naturalist but unlike me hasn’t specialised in birds. 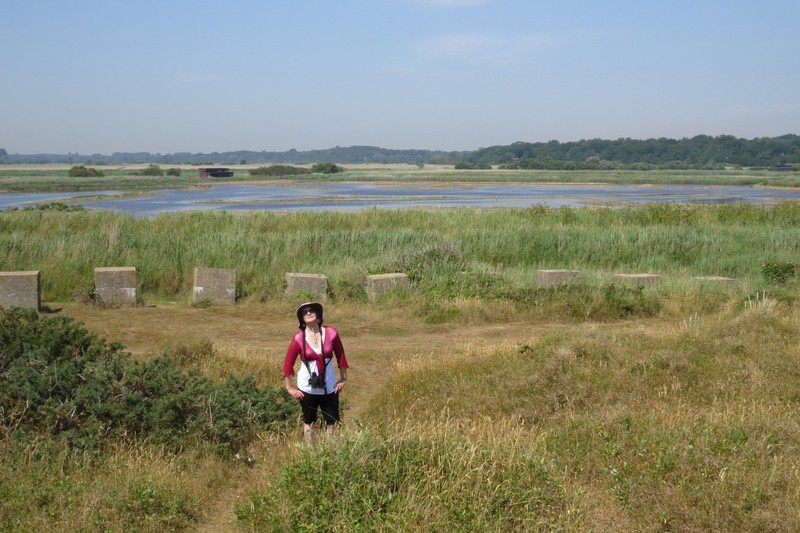 She does volunteer work at the nearby Wicken Fen, but it was to the larger and more distant RSPB reserve at Lakenheath that we journeyed. The visitor centre’s floor is covered with hundreds of beige coloured tiles, but just three are green with a sign that says the beige tiles represent the area of East Anglia that was once covered by fen and the green ones represent what is left! 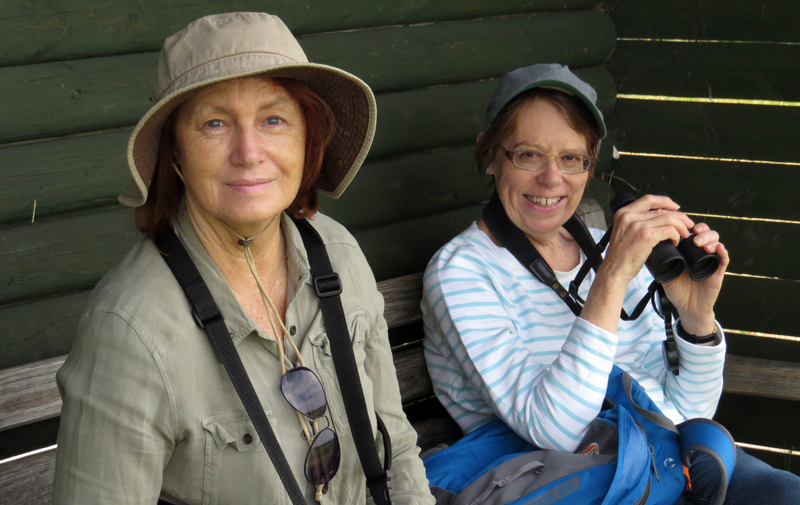 We saw some good birds including a Crane with its head poking out of the reeds, great flight views of a Bittern and several Hobbys but it was the local Marsh Harriers that put on the best show. Here a male returns with a full crop …. 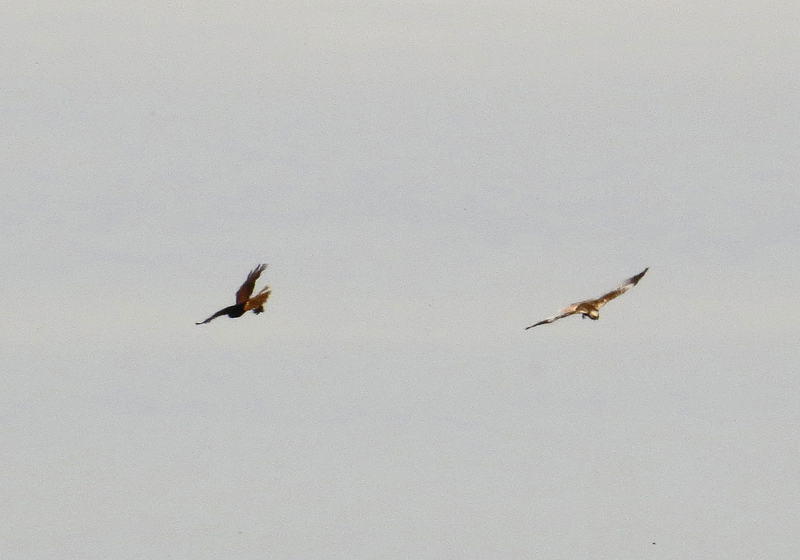 … but earlier we saw a male carrying prey fly over the nest site and performed a food pass, the female (left) rose up, the male dropped the prey which the female caught in mid-air. Butterflies abounded in the hot weather, I saw some Essex Skippers, a butterfly I haven’t conclusively identified before, but only this Large Skipper posed for the camera. Later we visited the nearby reserve of Weeting Heath, just over the border in Norfolk. 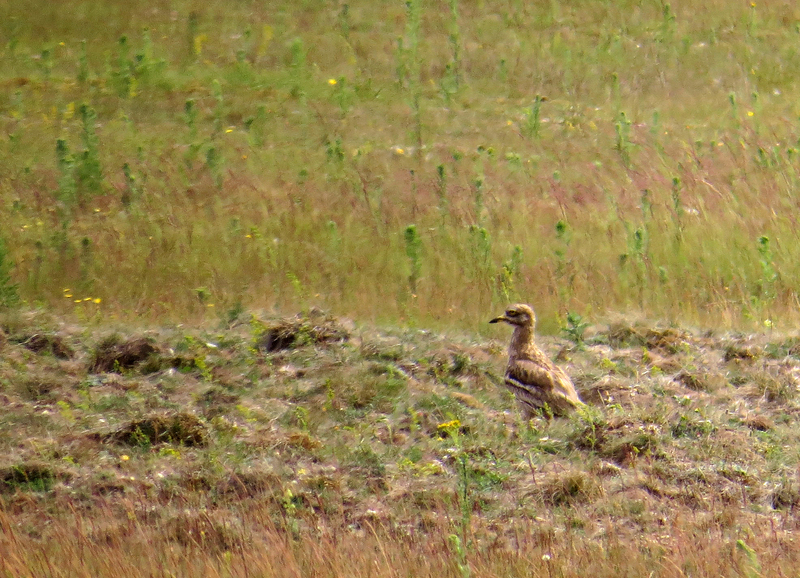 Here we had good views of several Stone Curlew a species that now is very hard to see in Dorset or its environs. On the 30th we headed for friends in Lowestoft but on route we detoured to Hickling Broad in the Norfolk Broads. Our main aim was to see the endemic UK race of the Swallowtail Butterfly which has its UK stronghold in the Norfolk Broads. I have seen this species many times in Europe but I’ve never been to this area at this time of year before. 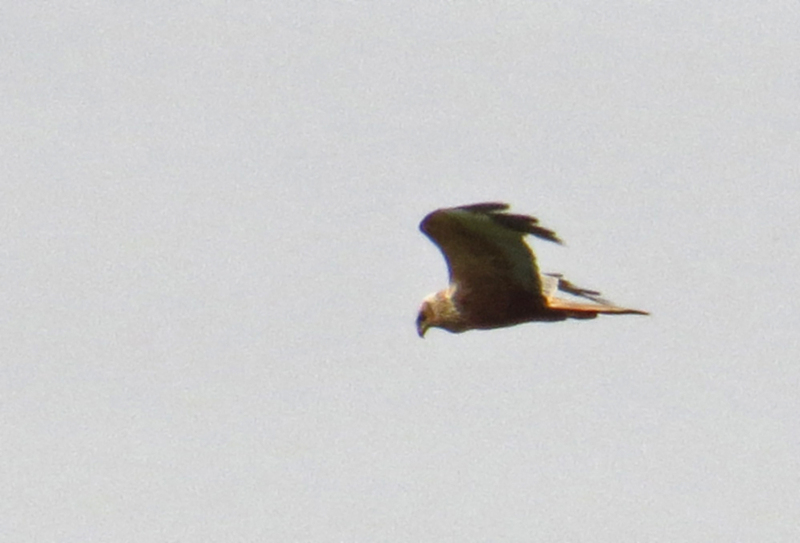 After some searching we saw three but they were fast flying and I failed to photograph any. This photo is taken from the Norfolk Broads authority website. We headed south to Lowestoft and stopped off at Breydon Water near Yarmouth where a Pacific Golden Plover had been seen for the last few days. 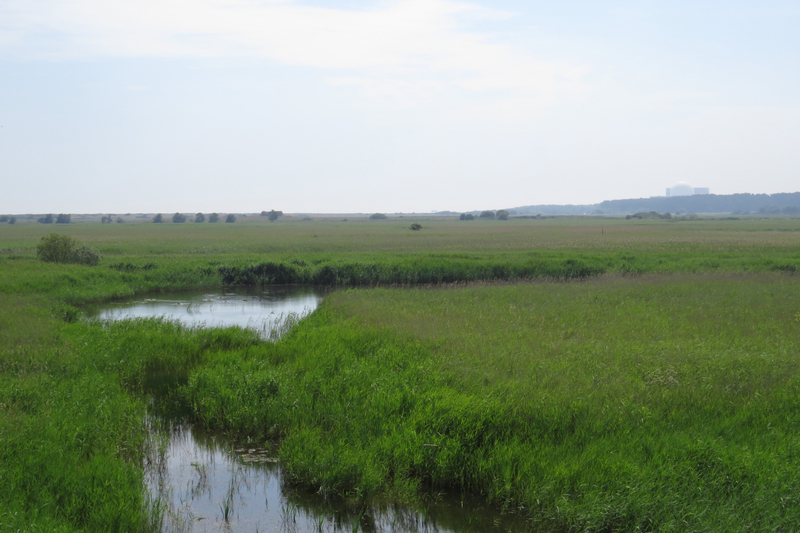 We had reasonable views but the heat haze was pretty bad and the bird often hid in the spartina grass. This photo comes from the Internet Bird Collection and was taken by Ken Harvard in Hawaii. The bird we saw was moulting out of breeding plumage unlike this one which was moulting into it and had less gold spangling on the upperparts but was similarly plumaged on the face, breast and belly. Pacific GP is a close relative of the American GP and breeds across arctic Siberia into western Alaska. The wintering range is huge, from eastern Africa across the Indian Ocean , SE Asia and all across the Pacific. There have been 83 previous records of this species up to 2013 and this is the third I have seen in the UK. Then it was on to Lowestoft, the most easterly town in the UK to visit my old friends Alan and Debbie. I have known Debbie since 1974, but I met Alan in 1969. Whilst relaxing in a coffee bar at Leeds University I heard Alan defending the performance of Derby County Football Club, asking if he was from Derby I found that he not only had lived in the same area as me but in the same street! I had met his sister back then but not him. He joined us in the infamous Fraser Terrace ‘slum’ for the next three years and we have remained friends ever since. 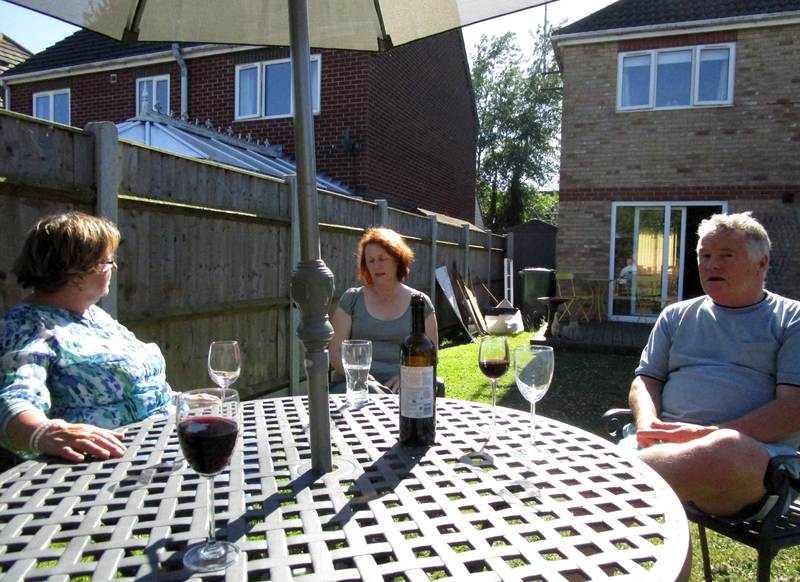 It was one of the hottest days of year with temperatures around 30c, so relaxing in the garden with a bottle of wine seemed the order of the day. Note the only one falling asleep is Margaret who was only drinking water. South of Lowestoft lies the RSPB’s flagship reserve of Minsmere. This was the subject of this years Springwatch TV series. 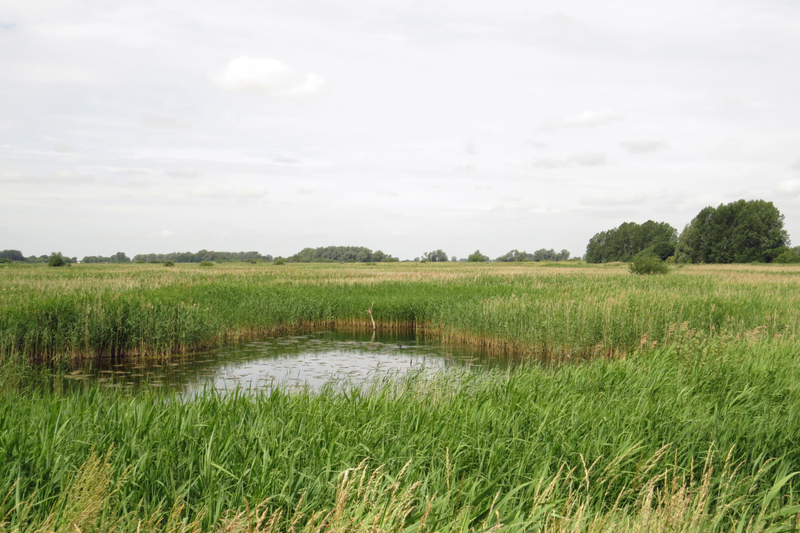 The reserve consists of extensive areas of reed bed, open water, muddy pools, heathland and woodland. 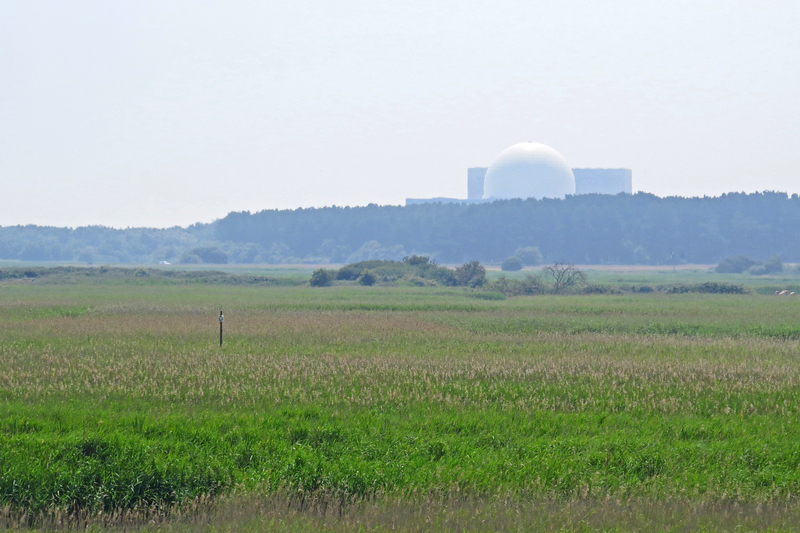 In the distance is the Sizewell B nuclear power station. Behind the beach lies ‘the scrape’ an artificially built pools that are a haven to breeding waders and migrants alike. 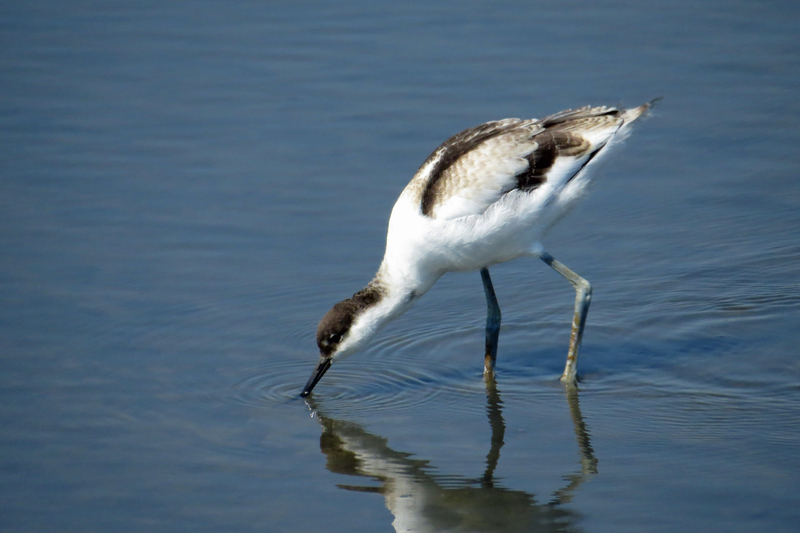 Perhaps the most famous breeding wader is the Avocet. Heavy predation of Avocet chicks by Badgers has resulted in the scrape being ringed by an electrified fence, which certainly worked as ‘the scrape’ is full of juvenile Avocets this year (compare with the Avocet chicks I photographed in Hampshire on 28th May to see how much they can grow in a month). 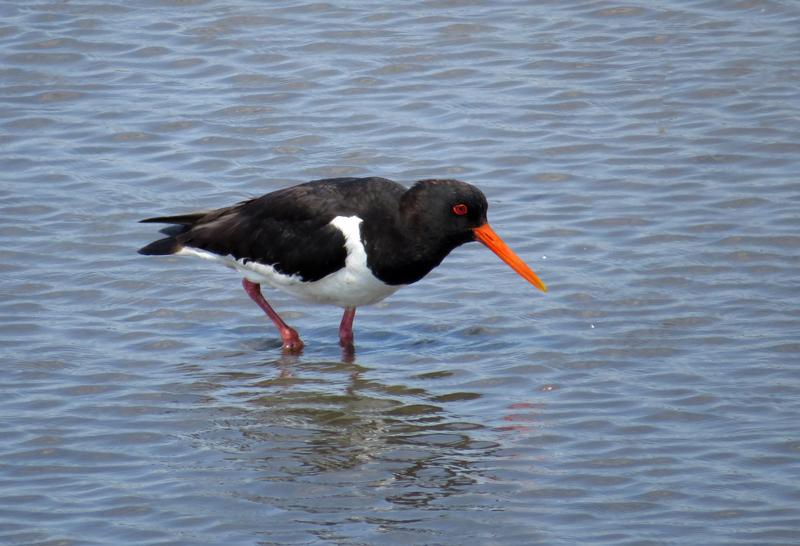 Other breeding waders included this Oystercatcher …. 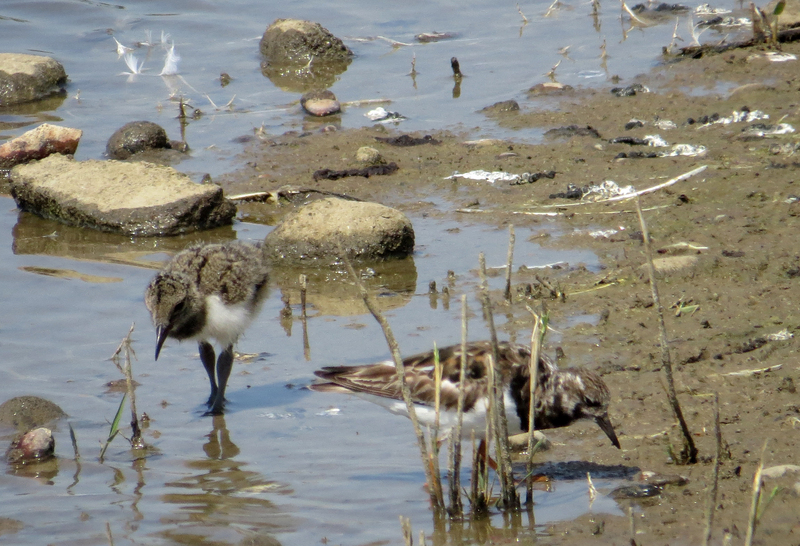 … and the Oystercatcher’s chick wandered around in the company of this Turnstone, fresh in from the high Arctic. 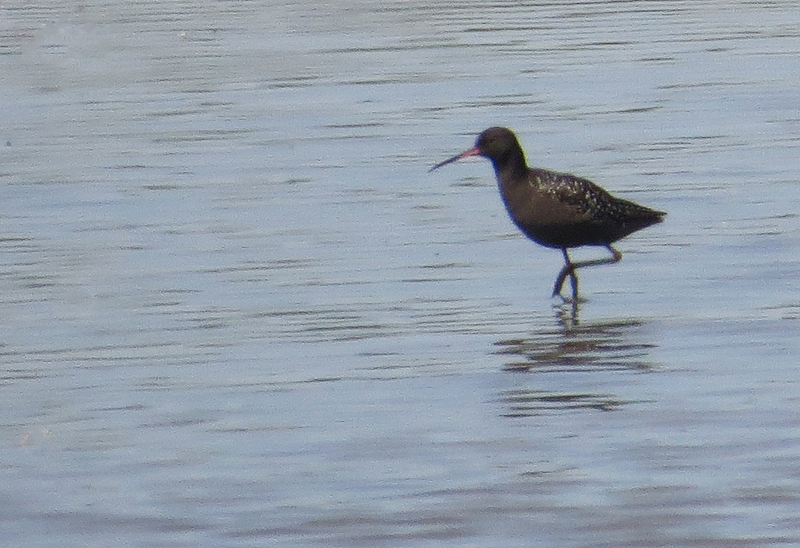 The best sighting on ‘the scrape’ was a flock of 50+ Red Knot, some still in their orangey-red breeding dress and a flock of 16 summer-plumaged Spotted Redshank (above). 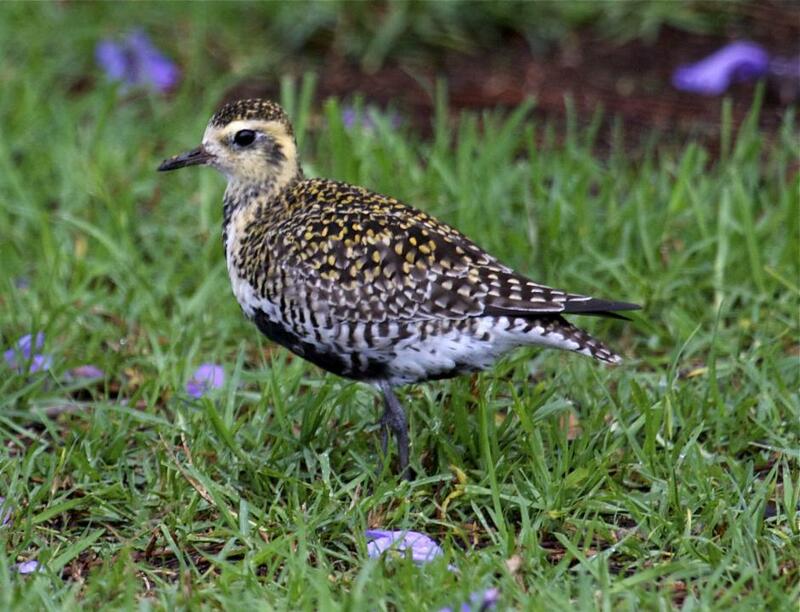 This species nests in boggy woodland in the arctic and uses a system of sequential polyandry, ie the female mates with one male then leaves him to incubate and raise the chicks, then may mate with another male who does the same. The females then migrate, so breeding plumage females can arrive in the UK from late June on their ‘autumn’ migration south. This species used to be much commoner in Dorset than it is today and partially breeding plumaged birds were often seen in Poole Harbour in April on their way north, but now it is mainly a scarce winter visitor to the area, a time when they are in their grey non-breeding plumage. Eastern Britain at this time of year is probably the best place to see these beautiful birds in all their finery. 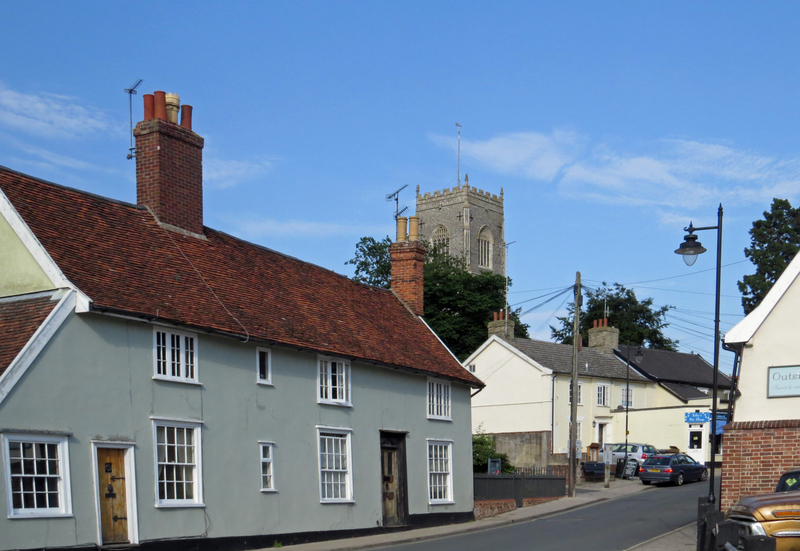 For various reasons our friends couldn’t see us in the most convenient order so by the time we arrived in Framlingham we had almost done a full circle. Terry, David and Margaret. Margaret was friends with Terry when she lived in South Africa. Recently Terry moved to the UK where she met and married David. David has a strong interest in natural history, particularly birds, and being completely blind has a great interest in their vocalisations. 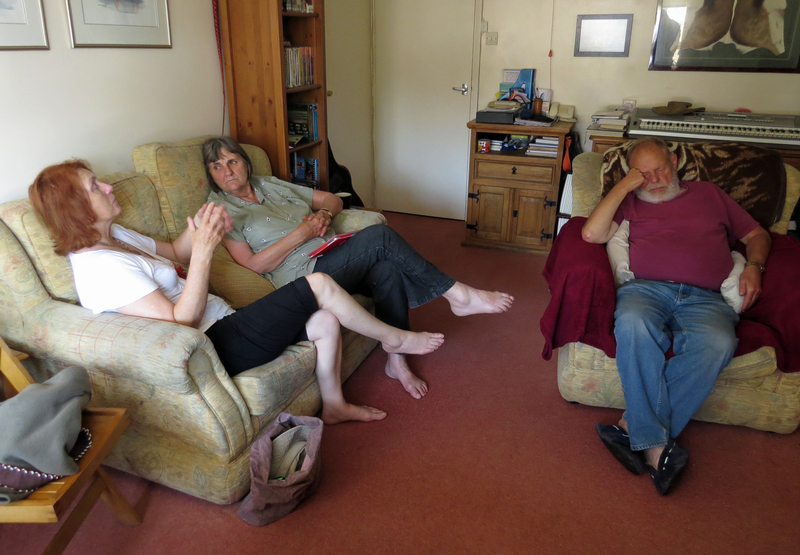 At the temperature was in the 30s away from the coast we spent the afternoon indoors discussing music and bird song. I took this photo in a nearby church in 2014. On 2nd July it was thankfully a little cooler. We left Terry and David after breakfast and started the long drive to Leeds in Yorkshire. This, along with a visit to Derbyshire will be the subject of the next post.